The Eye has returned and once more the Queen's Gaze holiday is celebrated across Elyria. Take in the new lore story that accompanies this event or get yourself some awesome limited-time items from our online store. Remember, these items won't be around for long, so read on and find out what's in store for you to get your hands on before they return to the vault! As previously mentioned our official Calendar of Promotions and Events, we enjoy making limited-time items available in our online store, and this event is no different! The following promo items will be eligible for purchase starting on Tuesday, October 23rd and lasting through Friday, November 2nd, at 12pm PDT. Here are the new store items you purchase for the next 2 weeks! There's no need to be superstitious when this adorable black cat crosses your path! Whether it's the calming effect of the purring of a content kitty, your love of MEOWs, or simply because a black cat makes for the perfect companion, we've got you covered. 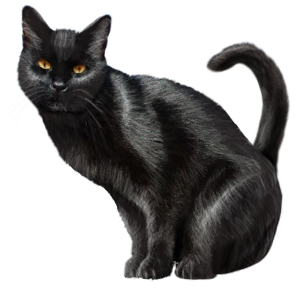 As a domestic pet, black cats can be trained to hunt for pests and perform other simple tasks. Finally you can answer the ages old question: How is a raven like a writing desk? Corvidae in general, but ravens specifically, are incredibly cunning birds. 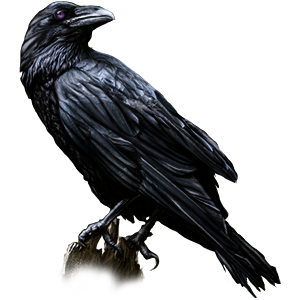 When it comes to having a trainable pet on the wing, there are few choices as bright or cunning as the raven. Not everything that travels the lands during Queen's Gaze is friendly. The legends say that Queen's Gaze is a time when the Soulless – liches, vampires, and other horrors – are most active. Many of these malevolent forces are said to be able to pass as the children of Mann, which makes detecting them a dangerous game best left to experts. But, if you happen to be one of those experts, then these are the tools of the trade you're looking for. Whether you are searching for a hidden horror or chasing a monster down to its nest, these tools will see you through. 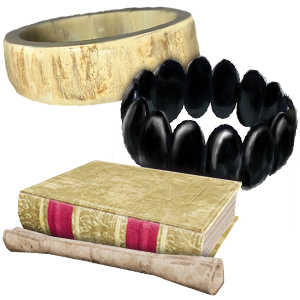 One bracelet of ivory, one of jet, each extremes of the other and yet identical in purpose. Is there a better symbol of the Al'Tifali faith? The Dras certainly don't think so. Paired bracelets like these have marked their faith for generations. The legends say that not every lost child is lost... or a child. According to the old stories, there was a time when monsters walked the land. Some of these creatures could take on the forms of their victims, while others would "ride" in the consciousness of their victims, influencing their victim's behavior to their own malicious end. In their early history, Drasean healers developed techniques to both reveal and drive away such malevolent spirits they call "inducement". The process was often risky and painful for their victims. When you only have one chance to strike, you need a weapon that will guarantee success. Known as the Chi`at'y Nesdr, this glass-bladed dagger is a holy tool of the Waerd. 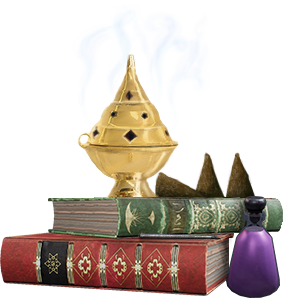 Used primarily in ritualistic assassinations, the poison held within the glass blade is an ancient recipe said to be able to affect daemons, and other monsters in addition to the children of Mann. 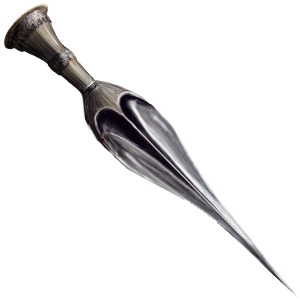 Each dagger can be used once, the blade breaking to deliver the poison inside, but the hilt is designed to allow a new blade to be joined to it after each use. The dagger's hilt is often engraved with prayers to the Two-Fold Queen. Reminder: These promo items will return to the vault on Friday, November 2nd, at 12pm PST. To further pique your interest and excitement about this holiday, we'll be borrowing from a holiday tradition on Earth as we introduce our first-ever Elyrian costume contest, The Queen's Carnival! Ever wonder what it would be like to dress as your favorite Neran Duchess? How about a To'resk merchant, or a Janoan warrior? Enter for fun or participate to win a prize. Starts: October 23rd when the Queen's Gaze promo is launched. Ends: October 31st (Halloween on Earth!) at 12pm PST. The idea is simple, create a costume in real life, dress it on yourself, someone, or something else, take a pic, and share your creation with us! You can dress as an animal or Mann, it is entirely up to you. Submissions must be either a JPG, PNG, or GIF - no other file formats will be accepted. You submit your entry to this form: ENTRY FORM. The maximum file size is 1MB. Your submission must include your account alias and associated email address. Your costume must be based on something from Elyria. Real-world themes will not be accepted. Your creation must be a real-life costume. No Photoshop or programs, no digital art, or sculptures. (The only exception is if you are using one to blur identity for privacy reasons). You can use any costume you want, whether bought or created. You can use any material you desire, be creative! Participant's account must be in good standing. Limit of 1 entry per account. Non-colored title in the official Chronicles of Elyria Discord "Champion of the Queen's Carnival"
Additionally, we will choose a few honorable mentions and include them in a followup article about this event in the November Community Journal. Winners will be chosen by a panel of Soulbound Studios developers, Ambassadors, and Moderators. Participants are prohibited from being a judge. Winners will be chosen based on originality, concept, and effort. Winners will be announced on November 2nd, 2018. That's it, the Queen's Gaze promo, Lore, and costume contest, so much going on! It's a great time to be an Elyrian, so what are you waiting for? Get busy! Don't forget the Costume Contest at the bottom of the post, we'd love for you all to participate!! Someone's been paying attention to fan requests! Excellent, a feline friend is the only thing I've been missing, now my Elyrian experience will be complete! A Raven? Really? Looks like you really want to make me pay more money....this is just great!!! Thanks SBS!! Ouuuh a black cat mhm. Ravencrest will celebrate with our new companions! "Recipe for Waerd killing poison"
How can any self respecting Dras Alchemist-to-be Not get this... Well played SbS. Well played. "Recipe for Waerd killing poison" How can any self respecting Dras Alchemist-to-be Not get this... Well played SbS. Well played. So the dagger and the bracelets, will they be limited to the races mentioned, or can say a Narian race redeem them when the game starts? It would be a nice RP item to use to show a mix heritage child perhaps. What can the Raven do though? 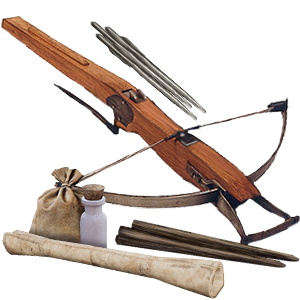 To quote Snipe on Discord, this should give some idea. The ravens are trainable pets, so you can train them to do certain simple things, but complex tasks like acting as bombers or delivering the mail aren't really on the table. But as a trainable pet you can train them to accompany you, stay somewhere, fetch something for you, attack your enemy, etc. Be the coolest corvidaeic accessory you can ever get. Duh! Jackdaws are about as cool, but they're another type of cool. Posted By **Ian111** at 01:26 AM - Wed Oct 24 2018 > What can the Raven do though? Be the coolest corvidaeic accessory you can ever get. Duh! Jackdaws are about as cool, but they're another type of cool. COSTUME CONTEST! I am ecstatic!